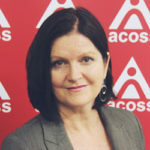 Cassandra Goldie is CEO of the Australian Council of Social Service (ACOSS). Cassandra Goldie, Friday, 12th April 2019 - Healthy, inclusive, thriving communities need quality, secure community services, writes ACOSS CEO Dr Cassandra Goldie, as part of a series of articles looking at what the social sector wants from whoever wins the upcoming election. Cassandra Goldie, Thursday, 11th April 2019 - This year’s federal budget was an extreme disappointment, writes Cassandra Goldie, CEO of the Australian Council of Social Service, ahead of their upcoming post-budget breakfast. Cassandra Goldie, Thursday, 15th September 2011 - Special Tax Edition | Why does tax reform matter to the community sector, beyond that it allows sufficient revenue to be raised for programs and services? Australian Council of Social Service (ACOSS) CEO Cassandra Goldie outlines how tax can change the way disadvantage is caused.